Achieve your New Years Resolutions - Choice by Choice. 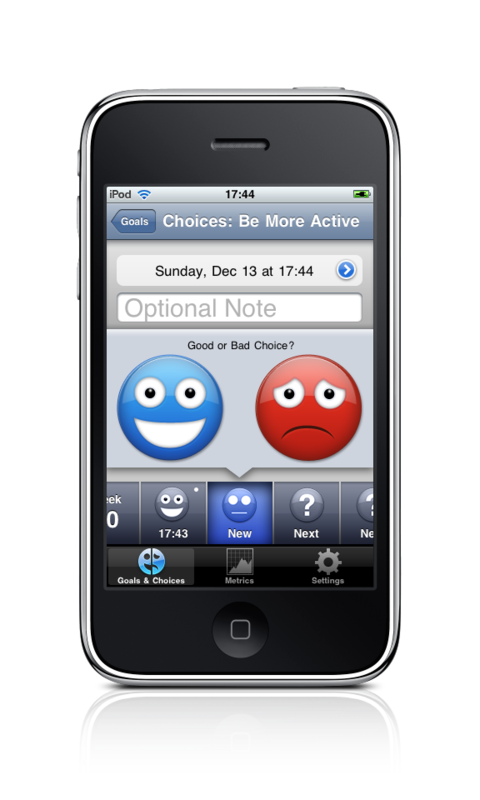 The simplest and most elegant personal achievement tool for the iPhone & iPod Touch. Set up your New Years Resolutions/Goals. Record the choices you make with simple, one-tap recording. Review and change your habits to achieve your goals. Every day we make choices that help or prevent us from accomplishing our goals. Choice by Choice lets you quickly and easily record these choices. Clear, clean graphics show your progress. Spot any bad habits and times when you need to make better choices. Beautiful and easy to use App. One tap entry of good or bad choices. Optionally keep notes for any of your choices. Track your progress during the day, week and year using beautiful, clear graphics. Spot and correct any bad habits. Visit the Choice by Choice Support Page.